We have a little home-away-from-home on one of the beaches here in NC. And y’all, when I say little, I mean little. We’re talking barely over 500 sq. ft. of little. But that’s perfectly fine with us because it. is. on. the. beach. Here’s a shot from our deck that I took while we were there last week. Can you tell how hazy it is? That’s because it was 105 degrees the day that I took this pic! As you look at the befores, imagine a place where nothing resembling any housekeeping had been done, walls that had cracking paint because old wallpaper had been painted over, rusty, crusty, nasty appliances in the kitchen, mildew/mold behind the old wallpaper. 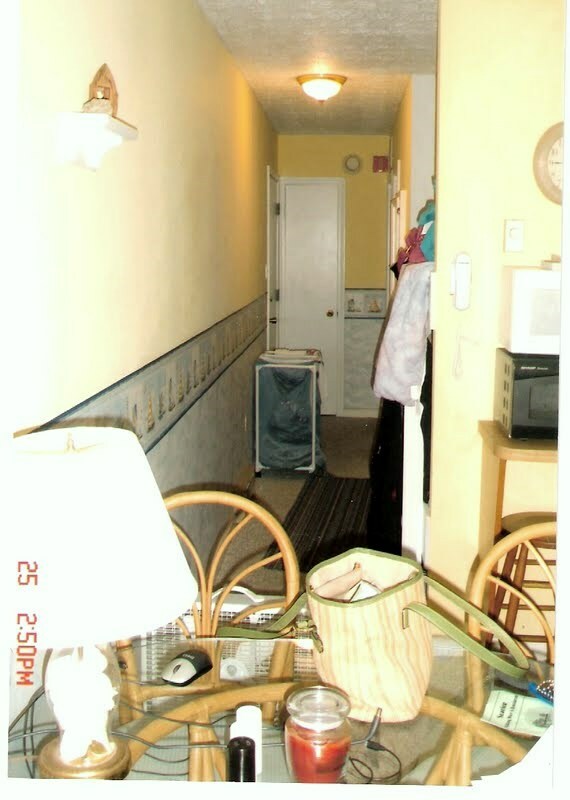 When you enter the condo, you immediately walk into the hallway that leads to the living room and kitchen. This is what greeted us when we entered the condo for the first time…….prepare yourself. This is what that same hallway looks like today. I’ll talk about the bunkbeds in a minute. That little black thing you can see on the couch is Diva Dog. She insisted on making her debut in this blog post. Step on into the living room. Diva Dog and Ferocious Guard Dog graciously agreed to put themselves on display for you. The couch pulls out into a bed. We had it made using a 6″ thick mattress instead of the standard 4″ ones that you usually find in sleeper sofas. Now it’s just about as comfy as our bed. Update: We came up with a clever way to hide the ugly A/C cord. Click HERE to see what we did. This chair is so cozy. 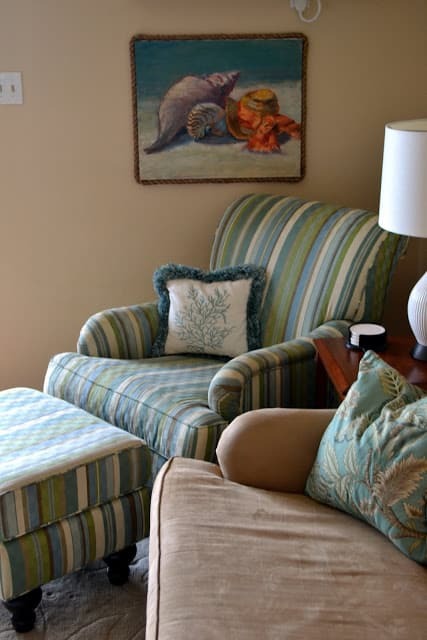 It’s a great little nook for reading, watching tv or just enjoying the view of the beach. This is what that same area used to look like. …that used to look like this. Update: This wall looks totally different now. 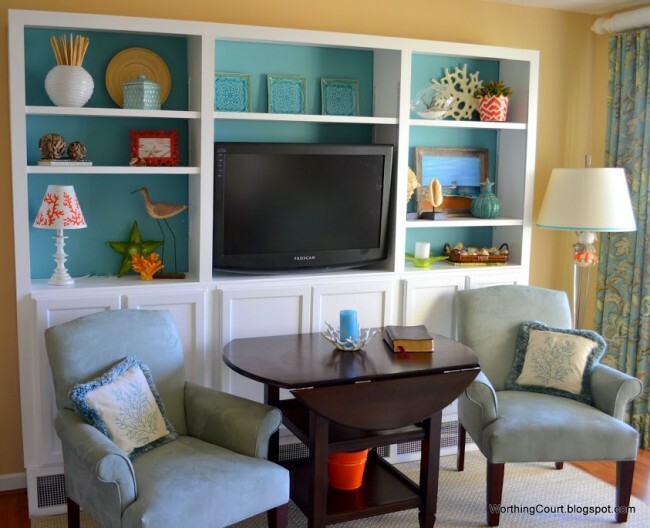 Click HERE to see how we built these bookcases using off-the-shelf kitchen cabinets. 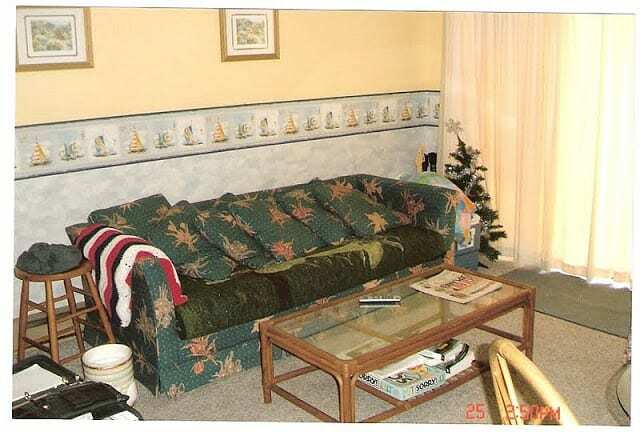 I refused to sit on this couch while we talked when we first looked at the condo. It was almost as gross at the carpet. They told us that all of the furnishings came with the condo. Um….no thank you. 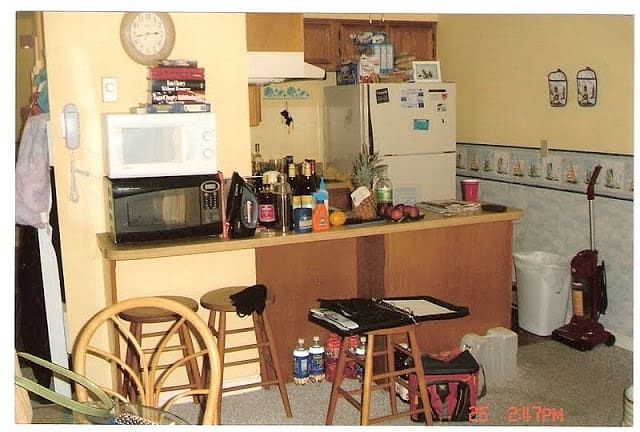 Turn around one more time and here’s the kitchen. Update: Here’s what the kitchen wall looks like now that the bookcases have been added. 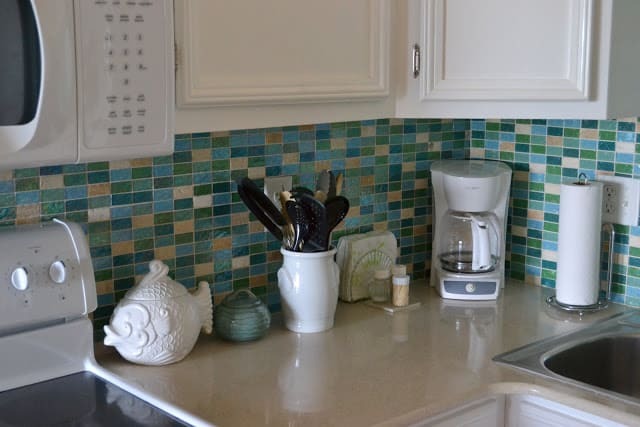 I love this backsplash. It’s made up of different colors of iridescent glass tile with travertine marble sprinkled throughout. 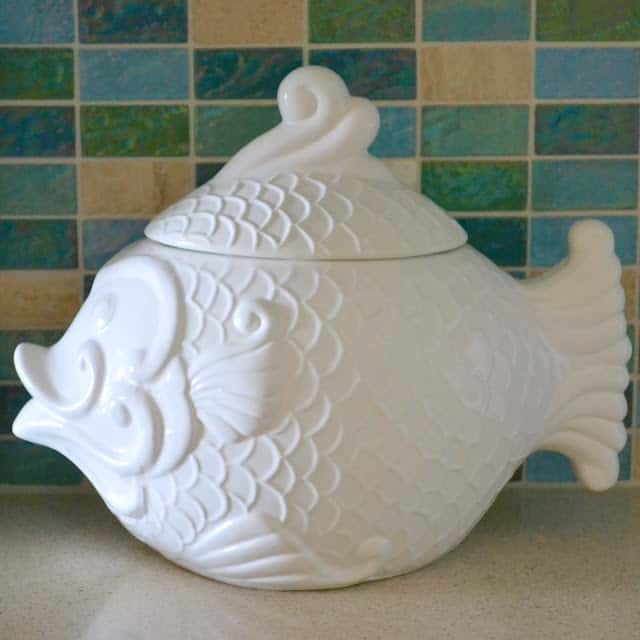 I love this little fishy canister too. So do Diva Dog and Ferocious Guard Dog because they know that this is where their treats are kept! 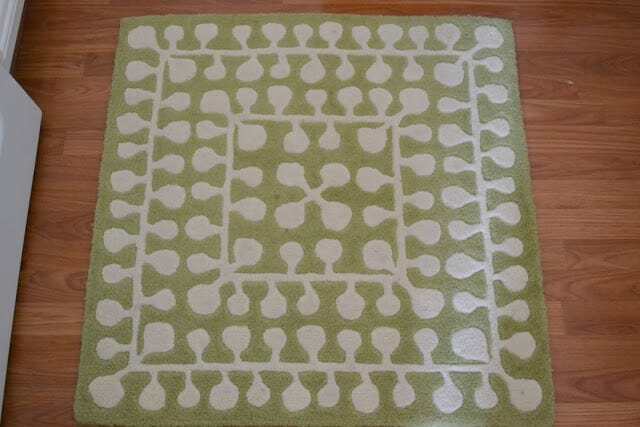 Found this little spit of a rug at Ikea. It’s the perfect size for my tiny kitchen. Hold your breath…this is the before of the kitchen. Don’t ‘cha just looove this little stencil that was above the sink? And hey – what a great place to hang your keys! See the built in bunkbeds on the right? The grandgirls love ’em! Here’s a little closer look. The wooden dowel rods are waiting for me to make and hang some privacy panels. We replaced the mattresses and went about trying to make the bunkbed cubbies a place where the grandgirls are in their own little world when they’re in bed. 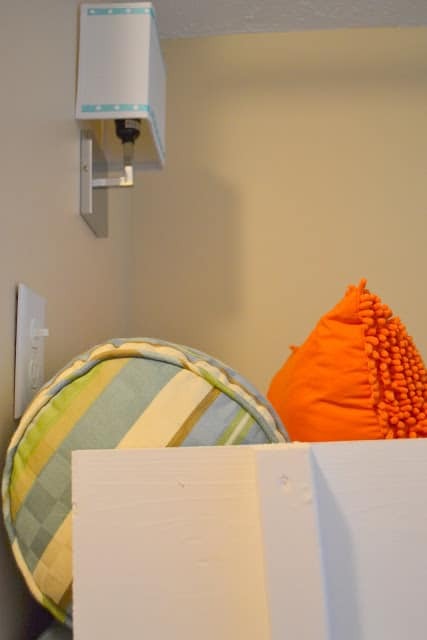 So we added a cute little light with it’s own light switch at the head of each bed. Each switch has an electric outlet on it to plug in video games or whatever. You can see that I added some cute dotted ribbon to the shades. 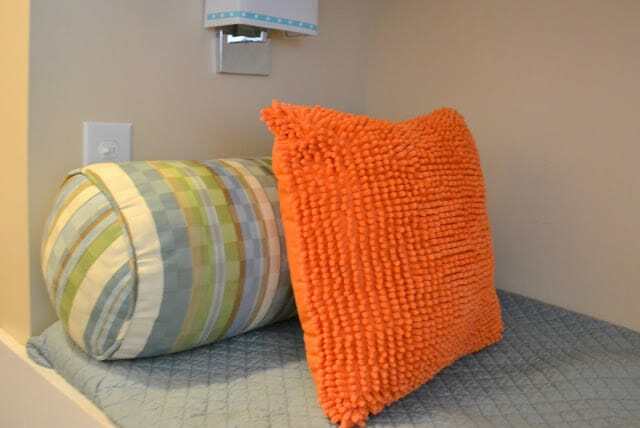 I made these oversize bolsters and added a pop of orange with the throw pillows. At the foot of each bed, we added these little shelves that we already had. I shopped around til I found some cute little baskets. Oh – the little clip-on fans work perfectly when it gets too warm. 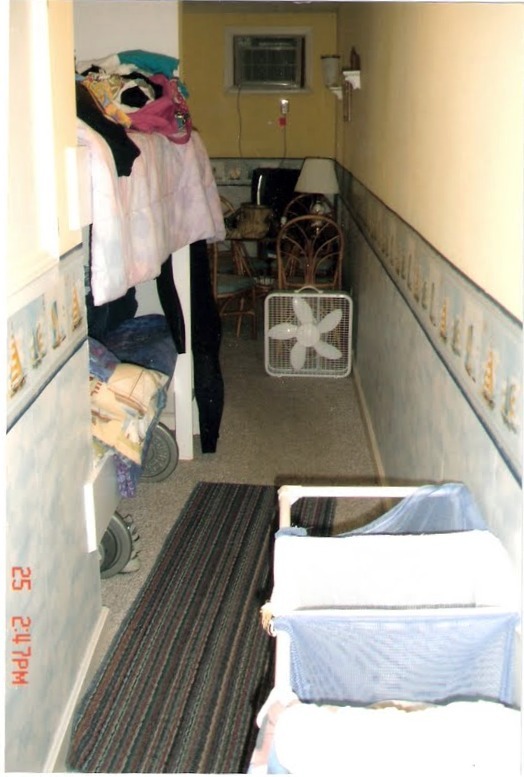 And lest you forget – here’s what the view back up the hallway looked like before. 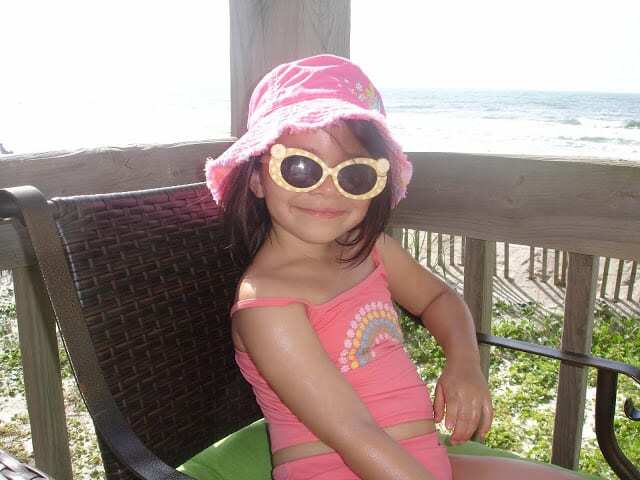 This is my sweet little Miss M sitting on the deck a couple of years ago. It’s one of my favorite pictures of her. Click here to take Part II of the tour. wonderful. I love this little place, so pretty and light filled. 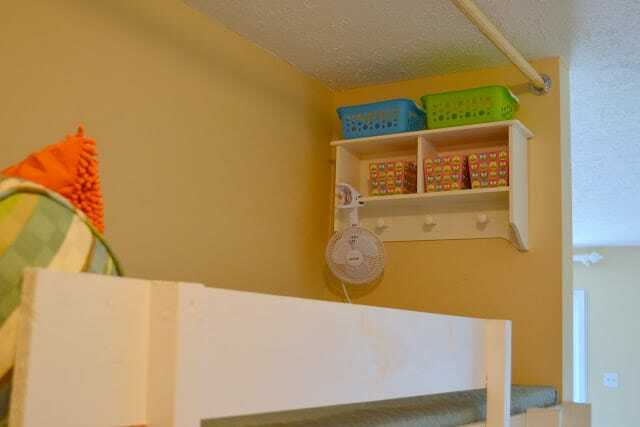 I bet the kids do love the bunks. those shelves just work perfectly. I was there when the backsplash was born! I fell in love with it & hopefully one day can do something similar at my house. I also somehow was volunteered to climb up to the top bunk & it was very cozy! Oh, this is great! Congrats, you’re a lucky girl, a house all your own NEAR THE BEACH, to sleep deliciously listening to the tide! I love it, girl friend and thanks for sharing. Oh how lucky you are to have such a beautiful place on the beach! You did great in restoring it! Thank you so much for linking up! Quite a transformation! 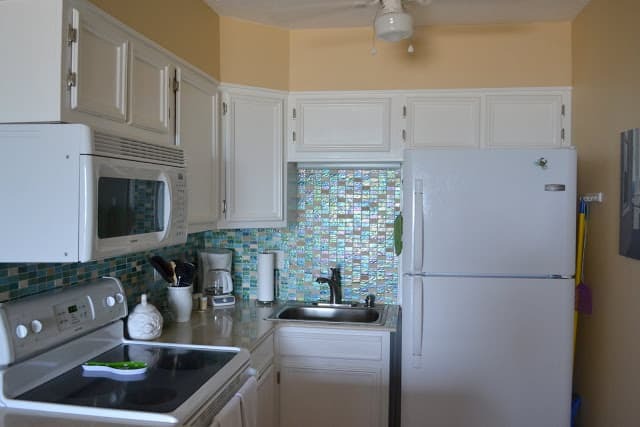 You did a wonderful job on the condo and I love the kitchen tile. Miss M is a cutie! Thanks for joining the Open House party this week. everything looks wonderful! 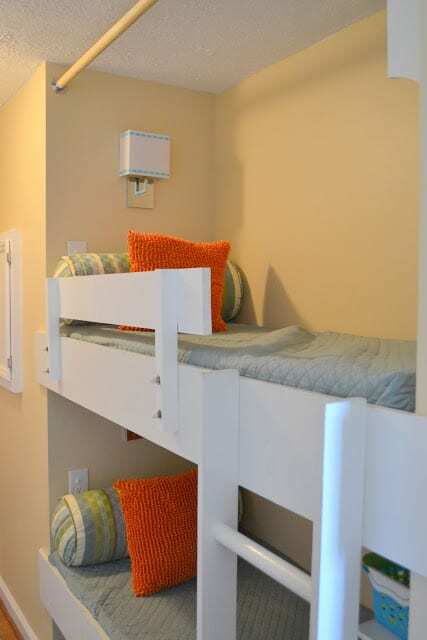 i love the built in look for the bunkbeds, and that backsplash is amazing! Love the rope trimming out your Aunt’s canvas. Now where’s YOUR boat painting??? I love it! When do I get to come for a visit?! Wowee!! What an amazing transformation! I absolutely love the bunk beds and truly everything you did is fantastic. You helped that condo live up to its full potential and we are so glad you shared this with us at Inspiration Friday! 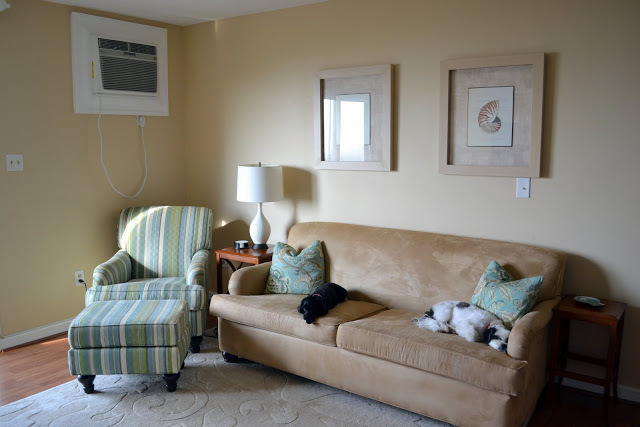 Hi Suzy, you did an amazing job transforming your condo ! It’s my first time visiting, great blog you have. I’m in NC and have a custom workroom too. Congratulations on a beautiful transformation ! What a beautiful house. You’ve made heaps of improvement. And it’s on the beach!! Nothing nicer. Wow!Wonderful job!Ilove the little sleeping cubbies, great use of space! OK I am so jealous. How cute, and all the updates and decorating are amazing. THanks for sharing with my newbie party. WOW! Your updates are amazing. You have done a beautiful job! I found you at the newbie party and I am super happy I did. You’ve definitely made this place yours. I’m a little jealous, I miss the beach! That is such a cute little beach house. Awesome job, Happy Monday! A great transformation; breathtaking view; and gorgeous bunkbeds! Wow super duper transformer of note!~~~ What more do you want with the beach right there. at http://www.designgivesback.com. Together we can change things! We appreciate you. Oh that looks sooo nice. And the fact that you live on.the.beach just makes it sooo much better! Love the transformations you have done, you have done such a great job! : ).. Your transformation of this space really is awesome! Thank you so much for linking up and partying at Home Savvy A to Z this week! Little Miss M. is adorable. I know she loves those neat bunkbeds. This condo is fabulous. What you have done is fantastic. I know you are enjoying your investment of time and money. I gave you an award. Come visit me to see! Can you share the source of your sofa and chairs? Hi all. 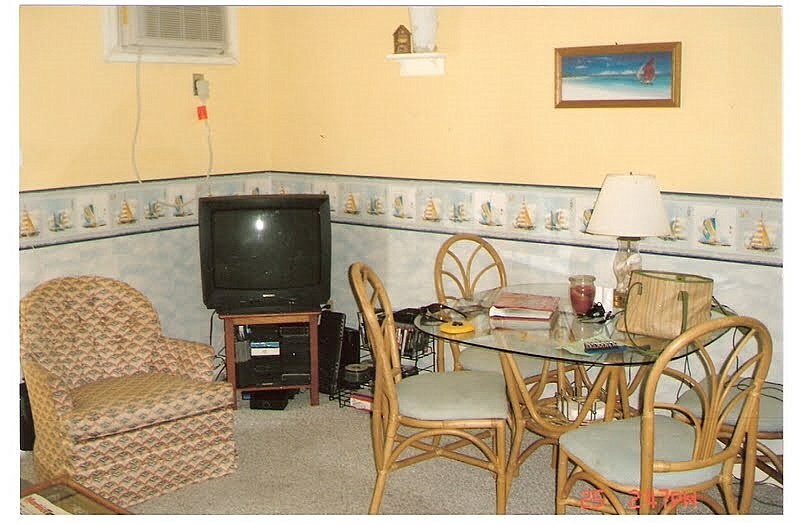 Regarding the furniture – the couch, all three chairs and the ottoman were made at a place located in High Point, NC. The prices were very, very reasonable. Everything is well made and is sturdy. I believe all the total price for all four pieces was around $1000. That price includes the fabric for the couch and two blue side chairs and an extra deep mattress configuration for the sleeper sofa. I provided the fabric for the matching chair and ottoman. I’ll be happy to provide more information if you’re interested in contacting them. It looks absolutely amazing. This is the good blog with good images and good details. If you feel bored, just swim in the relaxing beach. Please keep on posting the more stuff. I will like to hear more from you. I’d be willing to overlook all that mess so I could buy a place on the beach! 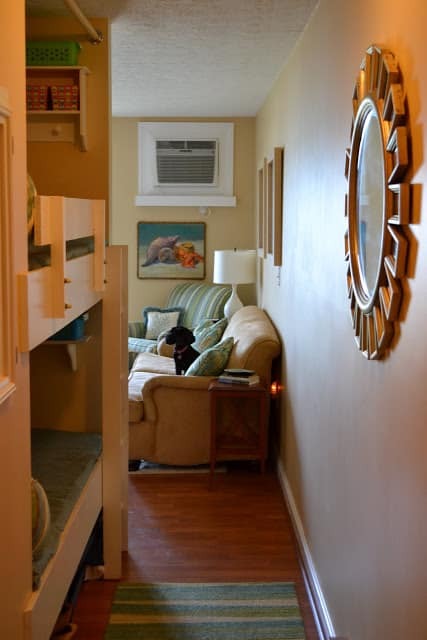 The transformation is amazing, and great use of space with the bunk beds. I LOVE that back splash and the awesome built in bunk beds! Suzy, thanks so much for stopping by my blog today. 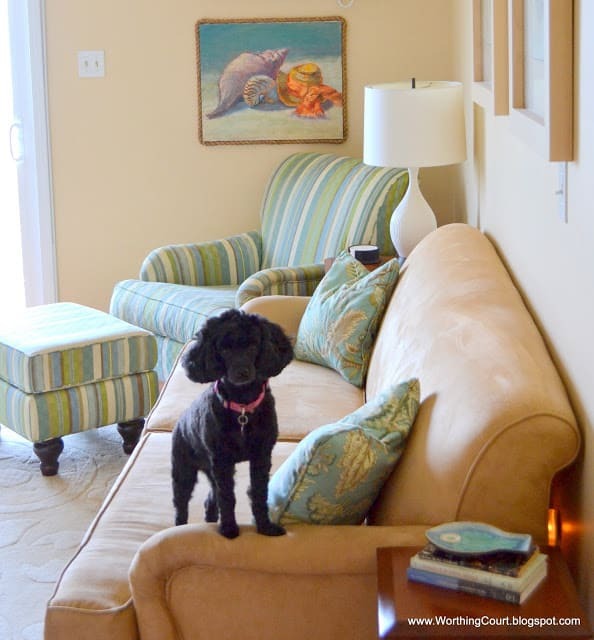 I love what you’ve done with the condo (read both posts)….it’s so cute! 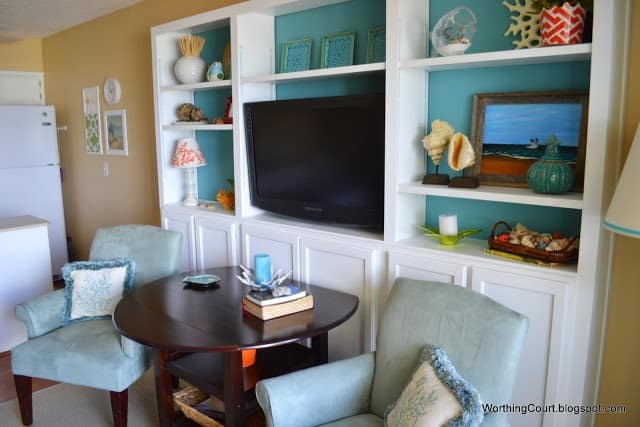 Coastal decorating is my fave decorating….love love the bunkbeds! That house is gorgeous, you decorate beautifully, Thanks for sharing it at the Picture is Worth a Thousand Words Photo Challenge. Could you please tell me the color of the creamy yellow wall paint? Hi Christine. I’m sorry, but I don’t have the paint color here at home with me. It’s at the beach! I’ll try to remember to look for it the next time that we’re there. Wow! Nice place and very relaxing area. I remember our house in this beach condo it is because in our province our house is near the sea and I really love our place. Thanks for sharing. Just took a tour of your beach condo. What a transformation! I love the bedding… how I wish I could sew if it means that is the result, and the tile in the kitchen is to die for! Thanks so much for the sweet comment and visiting me. Will be dropping by your inspiring blog often! 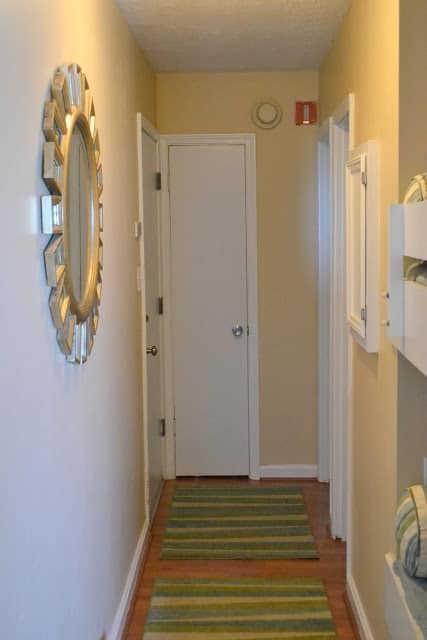 What a great job on the condo renovation! We, too, have a tiny condo at the beach and have been pondering a renovation for a couple of years. My idea folder is huge and I am adding your comfy pullout sofa with a custom mattress to that file. Please provide more details on how you added a thicker and more comfortable mattress to the typically very uncomfortable pullout sofa bed. Great Job! How did you paint do the cabinets? I have the same and want to update them. And what color is the yellow? Oh my word, Suzy. This is a stunning makeover! I would have been overwhelmed at the before but you did an amazing job! Hi Suzy! I love what you did with your beach condo. 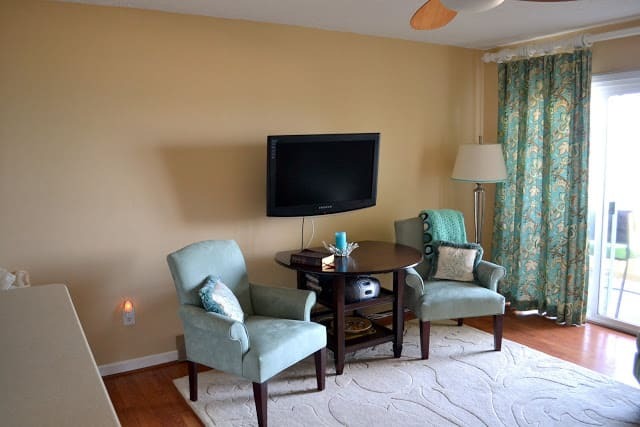 My husband and I are looking for a place at Atlantic Beach, NC. You have really inspired me to look at condos for sale which I had not thought of at all! My family has had a place at AB since 1986 and I just love it but am now looking for a place of our own. Could you please share more info on the backsplash in the kitchen? I LOVE IT! Hi Jennifer. I’ve spent lots of time at Atlantic Beach! My mom used to own a place in Salter Path before everything became so built-up. The backsplash tile came from Home Depot’s website. They didn’t have it in the store, but I was able to order a sample of it before I committed to anything. I’m sorry that I don’t remember the name of that particular style, but hopefully they still carry it and you can find it. Good luck searching for your special place! I’d love to hear what you find. I did not find anything like yours on Home Depot but I did find one laid out similar on Lowe’s that led me to a tile brand. Does Elida Ceramica sound familiar? Through that brand I found “Emperial Coral Reef”. The only thing that is throwing me is where it looks like yellow or gold in yours. Is that because it is reflecting your wall color? Thanks for the little help you did give, it seems to have led me in the right direction!!! Can’t wait to see all the neat things you continue to do at the beach! Sorry, but the names just don’t ring a bell. I did look at the brand though on Lowes website and the one in this link looks very, very similar and may be the same one. I’d have to actually see it to be sure. http://www.lowes.com/pd_409706-87523-CHIGLAHT81511PO_0__?productId=3761329&Ntt=elida+ceramica&pl=1&currentURL=%3FNtt%3Delida%2Bceramica&facetInfo= The yellow/gold color isn’t really like that – it must just be the way that the camera “translated” the colors. Some of the tiles are stone and some of those are slightly off-white. Those must be the one that the camera made look yellow/gold. Some of the glass tiles have an iridescent look to them which I’m sure are reflecting the light. What an amazing transformation! Love what you have done with this condo. 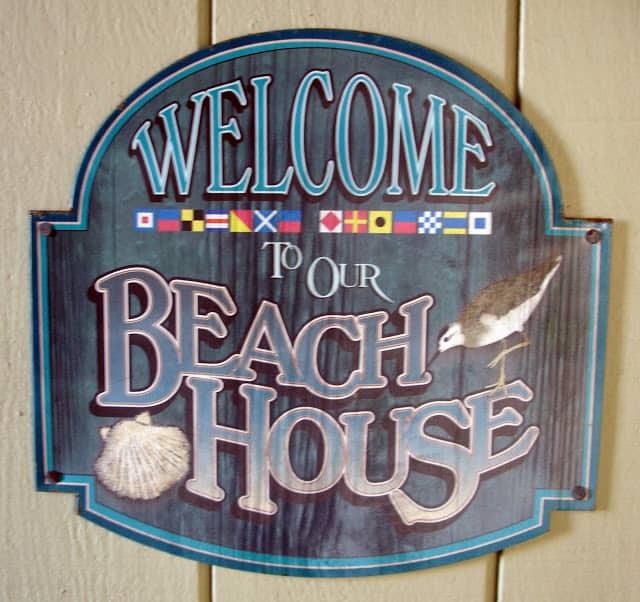 My husband and I have just purchased a condo at a NC beach. 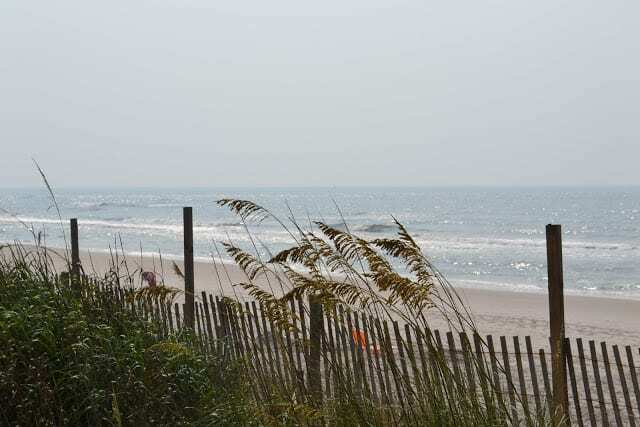 From looking at your pictures I think our condo is near your NC beach condo. Maybe across the street if your condo is where I think it is in NC. Our condo is 1200 sq ft, but the floor with the kitchen/living/dining is laid out like yours without the bunks. 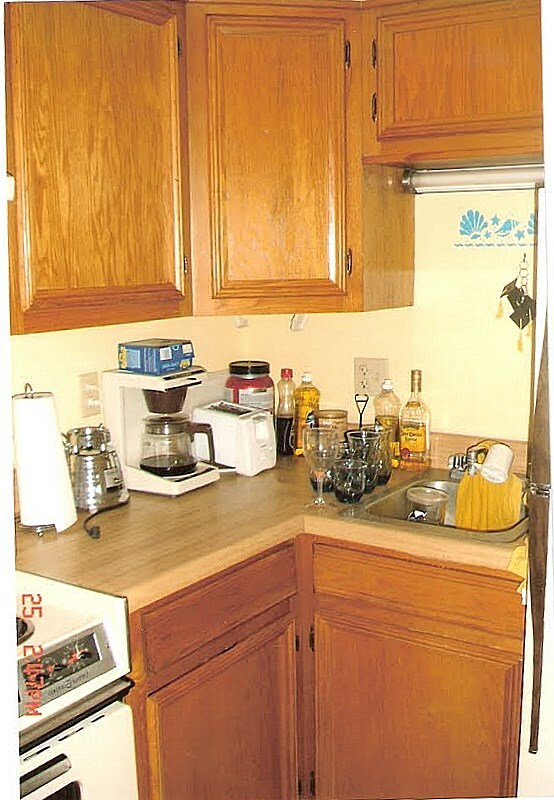 I love the “build in” made with the cabinets. Hope to do the same in my NC Beach condo. Thank you so much for sharing! Suzy, this is simply fantastic! What an unbelievable before and after….and all that attention to detail. Love that blue in the shelving unit! It was so great that you could see the diamond in the rough under all the clutter and dated decor. So many people would have passed it by. How wonderful to have a place like this. And I wouldn’t have been able to see past the “before” – it looks so nice! Lots of work, but well worth it. Looks so nice! 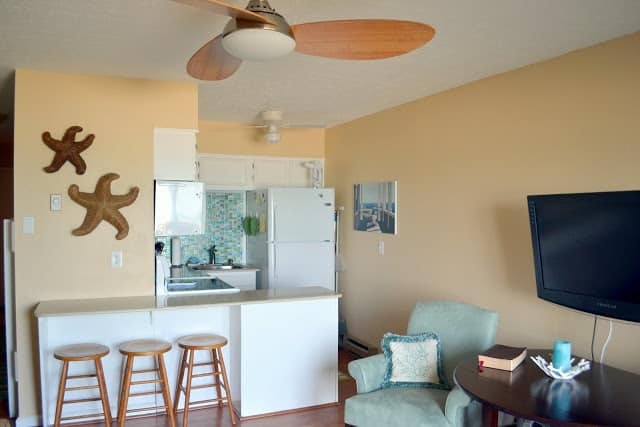 I love this little Beach Condo! How can you bear to leave it after all that work you put into it? Thank you so much, Sandy! You’re right – after so much work, it was hard to leave, but we are super excited to have a larger place where all of our family can join us!